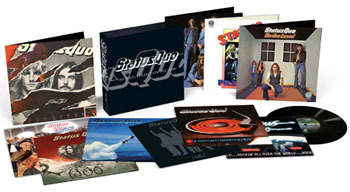 Share the post "News: Win 10 disc Status Quo vinyl boxed set and authorised book"
Win Status Quo Vinyl Collection 1972-1980 boxed set! Our latest competition running throughout September offers a chance to win the highly collectible 10-LP boxed set which features remastered 180gm vinyl with original covers, inserts and an exclusive poster in each record. With ten complete albums, including the double ‘Live’ album from 1977, this is a phenomenal collection that will be cherished by Quo fans the world over. 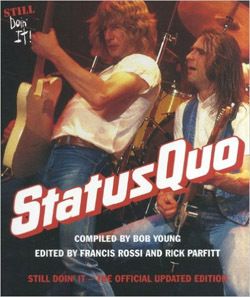 For the runner-up, there is the updated authorised history of the band, edited by Francis Rossi and Rick Parfitt and chronicling the band in words and pictures from 1966-2013. The competition closes 4 October 2015 and is being in run in conjunction with our Facebook page. This entry was posted in Competitions, NEWS and tagged book, boxed set, competition, Francis Rossi, pop, Rick Parfitt, rock, Status Quo, Still Doin' it, The Vinyl Collection 1972-1980, Vinyl. Bookmark the permalink.